Lutterworth Town are looking forward to a very special day in the club’s history this weekend when they play their first-ever FA Cup tie. The Swifts rapid rise over the last few seasons has seen them climb up the divisions and they have now finished high enough to enter the world famous competition. Their debut will see them entertain Heanor Town on a day when they will also officially open their new stand at Dunley Way. It should be an afternoon to remember. 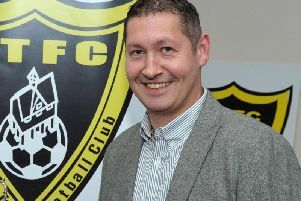 “We’re really excited about it – it’s another bit of history that this group have made,” boss Josh Dixon said. “Hopefully we’ll get a good crowd in and the town will get behind us. “We’ve put a big banner up in the town and we’ve been handing out fliers so it would nice if people come along and support us. “It’s another great achievement. Every season we seem to tick another box off and playing in the FA Cup is the next one. “We wanted this to be a home game and thankfully we got one. “It should hopefully be a great day. “We’re also unveiling our new stand. It’s named after my Dad’s (Andy Dixon, the club chairman) best friend, Kev Young. The FA Cup tie comes very early in a season which only began for Lutterworth last weekend. 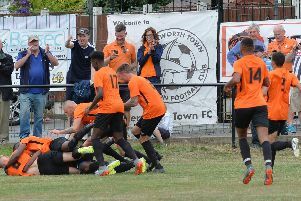 They got off to the best possible start by winning their first match 4-0 as they brushed aside Long Buckby in Future Lions United Counties League Division One. Tendai Daire struck twice with Jordan Small and Mark Warren adding the others. It was a welcome result for Dixon after an off-season that did not go as smoothly as he would have liked. He added: “We won 4-0, kept a clean sheet and had our strikers amongst the goals – we couldn’t do much more really. To start with a 4-0 win is obviously exactly what you want. leave and then come back. Also recruitment proved difficult. “But it started to come together toward the end of pre-season and we’ve got a strong squad together again. “The summer was also different because we were concentrating on things away from the first-team. “We’ve been sorting out the new stand but we’ve also added under-18 and a under-21 teams as part of a new youth set-up. Town were not the only Lutterworth side to kick-off their campaign by firing in the goals. Athletic opened up with a 3-1 win over Thrapston Town to give their new management team a successful start. Their goals came from Alex Rhodes (2) and Harvey Morgan. They are back in Division One action this weekend when they travel to Bourne Town. Things did not go so well for Harborough Town. Their first Premier Division game ended in defeat as their trip to Cogenhoe United brought a 2-1 reverse. And that was followed by more misery on Tuesday night when they lost 5-2 to Daventry Town.